Opening Reception: Friday, May 17 | 6-8 p.m. Exactly 30 years back, in my mid-twenties, I came to this country with my husband. By chance I stumbled upon Columbus Cultural Arts Center and started taking classes here under the tutelage of Jon Wahling. Each morning I used to take the bus from the OSU campus to come here and weave. It has always been a dream to exhibit at this gallery some day and being able to fulfill that dream today is extra special for me. This exhibit is like a homecoming for me. It speaks about my journey as a Fiber artist from the beginnings here to where I am today. I have always believed that a body of work by an artist carries the stamp of individuality and the national bearing of its creator when it springs from inner self. Being from India, a country with an extremely rich heritage of Art and Culture, I have had a deep-rooted attachment to its traditional art forms and owe some of my stylization to the captivating patterns and the rich array of colors. Adapting to Western Styles and techniques and combining them with my roots has been a melting pot for me to create a multicultural ‘canvas’. In my everyday life, my escape, my retreat, is my creative power of Art. My work is indigenous to my inner self and a place of solitude, passion and contemplation for me. The subject matter of my work is drawn from my own life experiences, travels, thoughts and surroundings. My art is like a journey for me through the passage of time-honored techniques, traditions and influences in an endeavor to create art for everyone. The final offering is the culmination of a series of wordless conversations between me and my artwork. By now I have spent more years here than my original homeland and my work reflects visions and experiences from this world. Images, people, places, corners, experiences, moments from my origin always keep showing up in my subconscious mind. No matter how much I have adapted to my life here and embraced everything with all my heart, that love, longing for the roots is embedded deep somewhere. And hence that question of "Belonging" comes to mind constantly. Where do I really belong? My ongoing search for the answer continues through my artwork. 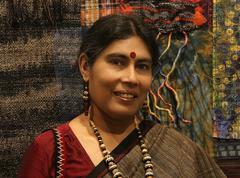 Boisali Biswas is a studio artist working in mixed-media fibers, currently residing in West Bloomfield, MI. She is originally from India, and her formative years were spent at Visva-Bharti International University, founded by the Nobel Laureate, Rabindranath Tagore.The essence of that profound experience of being in tune with nature throughout the educational journey has stayed with her and continues to influence her work. She has always had a deep-rooted attachment to the traditional art forms of her culture-rich homeland.There is an underlying influence of the captivating traditional patterns and techniques and usage of stunningly rich array of colors in Indian art. Boisali has also had a lifelong fascination for ethnic and indigenous arts from around the world. Living in this country for over 2 decades and adapting to Western styles, techniques, inspirations in concert with her background and fascinations has made her Art into a cauldron of multicultural assemblages that are very unique and feast for the eyes.